BEIJING, Jan. 23, 2019 /PRNewswire/ -- "Digital technology is lowering the operational cost of industries and is becoming the core way to achieve inclusiveness and equality. This is JD Digits' focus," said JD Digits CEO Chen Shengqiang on Tuesday at the 2019 World Economic Forum Annual Meeting in Davos, Switzerland. Chen made the remarks at a live streamed WEF session called "Governing Data in Our Daily Lives." 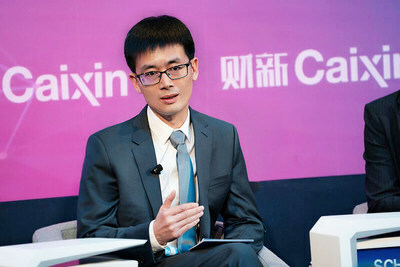 Chen also introduced JD Digits' three major business models of Developing Digital Capitalization, Asset Digitalization, and Industry Digitalization, and shared about the value of applying digital technology to the financial and real economic industries. In the era of the Fourth Industrial Revolution, data is the key production factor for business. How to use data more efficiently and rationally, and how to use digital technology to drive economic development were the hot topics at this year's meeting. For the business of Developing Digital Capitalization, JD Digits builds a risk management model by adopting data from e-commerce industry and applying AI technology. This helps more individuals and small enterprises get access to loans, according to Chen. "Services previously provided by traditional financial institutions were more focused on high-profit large-scale clientele. But using digital technology we can help those individuals and small and medium-sized enterprises with reasonable demands get access to the fair and reasonably priced financial services that they need," remarked Chen. One example of this is how JD Digits launched the service "Baitiao" based on a risk management evaluation system. This system offers many millennial their very first credit service. "For the business of Asset Digitalization, JD Digits uses data and technology to build the capacity to identify and rank asset risks. This can help financial institutions reduce transaction costs in capital markets and improve the efficiency of risk identification," Chen added. JD Digits has built its core capacity via their Developing Digital Capitalization, and Asset Digitalization businesses. To provide better financial services to other industries, JD Digits has expanded its business into their Industry Digitalization. The Industry Digitalization business uses digital technology to upgrade the entire business process of real industries. Chen believes this helps industries develop by lowering costs and raising efficiency, and creates a better integration between the finances and the rest of the business. He provided JD Digits' Smart Breeding service as an example. About 700 million pigs are sold on the market every year in China, and the breeding business is valued at 1.1 trillion yuan. But this valuable industry faces many problems, such as the difficulties of price cycle disruptions, the impossibility of tracing food safety, industry turbulence, low efficiency and the high costs in the process of pig breeding. To solve these challenges, JD Digits developed a Smart Breeding system including Shennong Brain, an AI inspection robot, an IoT feeding robot, and a set of SaaS modules. This system can monitor the temperature and humidity in pig farms, accurately identify and feed the pigs differently based on their individual needs. The system monitors the pigs' physical and health conditions in real time. The smart system can reduce breeding labor costs by 30% to 50%, cut the amount of feed required by 8% to 10%, and shorten the breeding time by 5-8 days. If the system could be broadly applied across the agricultural industry in China, it could effectively lower the industry costs by over 50 billion yuan. Chen also emphasized the importance of data security saying, "We definitely should raise consumer awareness of data security. At the same time companies should also follow regulations in obtaining, using, storing and transferring customers' information. Companies must adopt technology to ensure data security."